I live on a headland between the mouths of two rivers, so each time I go out for a run I decide between the Cuckmere and the Ouse. Lately I seem to find myself going more to the former. For a nine miler, I chose to run out and up to High and Over, then down a long, beautifully grassy slope to the river itself, upstream to the Littlington bridge and back on the east bank to return home over Seaford Head. It was a glorious day and, though I find them a hindrance, I was grateful for my water bottle. I met a few ramblers, two herons and many sheep and their lambs. In the event, I covered nine and a half miles. As I ran, I tried to understand whether running, and my approach to it, is either classical or romantic. I came to no clear conclusion. In Radio 3's Spirit of Schubert festival, of which more on the other blog, today was the day of Schubert the Wanderer. What better day to talk to Julia Armstrong about running, for a podcast to be published next week. I'll say more when it's out. In the evening, I ran with the Striders, five miles plus warm-up and cool-down, and the first off-road run of the year. We left promptly to use the last of the light, and ran up to Fiveways across the golf course, then back down to Firle Road. Many of us were fresh from triumphs at Sunday's Hastings half-marathon. Tomorrow, nine miles. So said Colette, or Coco Chanel, or one of those other French women. It applies as much to running as to one's appearance. For the long run today, I chose a route with a lot of ascents, through Friston Forest and up to Lullington Heath, then down into the Cuckmere valley and up again onto the Firle Beacon escarpment. Though a mere fifteen miles, I did indeed suffer, and was worried that the ilio-tibial band problem of may years ago might be recurring. Some judicious stretching is required. It was a beautiful morning, though cool on the high stretches. I do wonder about my training. By this time before previous marathons, I usually have more miles under my belt. I take comfort in the belief that fifteen miles of hard hill running is worth a lot more than fifteen miles on the flat, and that when I come to the marathon I will be ready. This week has been more encouraging. While I did not run the prescribed distances, I ran often and far enough not to feel disgraced, a fartlek on Tuesday morning, a run with the Striders on Wednesday and on Friday an early morning run, on which I was able, for the first time, to run off-road. I left the house a little after 6, to meet my daughter on the doorstep, returning from celebtraing her birthday in Brighton nightclubs. Geese called in the mist, and there were lambs. As for today's long run, I could only fit in two hours, nearly eleven miles, to High & Over, Fiveways, and over the downs to Norton and Bishopstone. It was warm and for the first time in this training session I took water with me. My legs felt heavy after swimming butterfly the day before, but I kept going. I met two beekeepers, dressed in their working armour, and wielding smoke as they herded their charges into hives. The omens were not propitious. Marathon training had slipped, losing about twelve days, I had a hard swimming coaching session the day before, I had been woken frequently in the night by importunate cats and the weather forecast was foul. Moreover, the last time I ran this race, in 2009, I did not enjoy it at all. Nevertheless, with over a thousand other foolhardy souls (the organisers said they had had over 1,500 entries, but I would bet there were a fair number of no-shows) I found myself huddled in a park. The pre-race warm-up session was unusually popular; normally I shun this sort of thing, but even I felt the need to jump up and down a little to keep myself warm. We herded ourselves behind the barriers for the start and set off. The first part of the course, along the sea front and up to the foothills of Beachy Head, is pleasant enough, even in rain and wind. 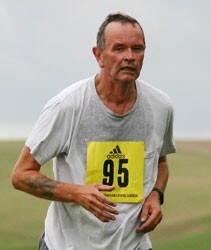 I ran all the way up the hill (I think I walked a little of it in 2009), and enjoyed the speed of the descent. We had the pleasure of a piper to encourage us and, in these conditions, I am more than usually grateful to the marshals and the supporters that turn out. As I never bring my entourage with me to races, I find it especially encouraging when complete strangers urge me on. The second part, through the desolation of Sovereign Harbour, is less enjoyable, but I found I could keep going, and had no dark-night-of-the-soul moments, in spite of being drenched, and running the last mile in an icy blast blowing off the English Channel. I was slow, 2:13:33 by the official chip time, about thirty minutes slower than my half-marathon personal best, but under the circumstances I am not unhappy. I go on into March, the heaviest month of the schedule, in good heart.